It was a plan that the Wabbit thought might just work. He rummaged in his fur for something he hadn't used in a while. Eventually he found his ageing harmonica and he blew a little dust from the mouthpiece and raised it to his lips. The harmonica wailed long and plaintively then set up a slow blues pace while the Wabbit's powerful rear leg beat a tough rhythm on the tanker that the Skuttles couldn't ignore. They jolted around and made straight for the wine tanker and their legs flailed in drunkenness. "Oh we've got some wine, you can have some too," sang the Wabbit." "Woo hoo," trilled Lapinette, "Woo hoo," echoed Ghost Bunny." 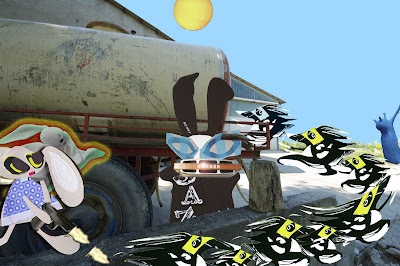 The Wabbit's harmonica cried and moaned as the Skuttles rushed straight past him in a frenzy. "We've got more in the tanker and it's all for you," sang the Wabbit. "For you," chirped Lapinette. "So true!" sang the Big Blue Snail melodically in the distance. The Skuttles swerved and squeezed into the tanker, making strange slurping and booming sounds. The more wine they drank the more room there was for Skuttles. And when the last Skuttle went inside the Wabbit slammed the hatch shut and locked it. Then he rapped a short rhythm on the tank with his paws. Lapinette turned to the Wabbit and smiled. The Wabbit smiled back. "Never give a Skuttle an even break," said the Wabbit.